MONTREAL, November 16, 2013 — Monika Weiss is back with two new works to mark the opening of the new space for Galerie Samuel Lallouz at 1455 Sherbrooke West. The gallery introduced Monika Weiss to Montrealers in 2006 and her last solo show here in 2008 changed the lives of more than one viewer. Her transdisciplinary work combines drawing, sculpture, music, choreography, performance, installation and video with an intellectual interest in mythology, history, philosophy, art theory and feminism. This unique and powerful combination produces works of great stillness and beauty that disturb time and space in order to commune with the past, as fact, as memory, as absence, as loss and to evoke all the accompanying feelings. Underneath it all, expressed ever so gently, is an anguished critique of the mess we make of the world. She is the contemporary artist to watch. The two works on display at Galerie Samuel Lallouz offer a privileged glimpse into her style of performance and her recent artistic practice. 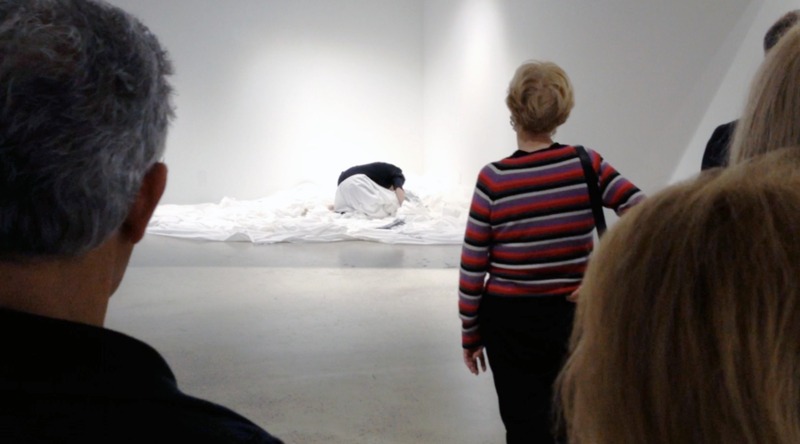 By herself, as in the ephemeral installation/performance Aletheia II, or with others, as in the video Anamnesis II (Canto 1 and Canto 2), she “inhabits” (her preferred term for her physical presence in a work) an unidentified horizontal space, characterized only by cotton or canvas material. With eyes shut, she lies in that space and moves ever-so-slowly within it, feeling her way towards all the possible meanings. She leaves traces in the changing shapes of the material or sometimes in actual markings on it. Video cameras, standing in for aerial photography – something Weiss has also experimented with – record all from above. She then edits the video. 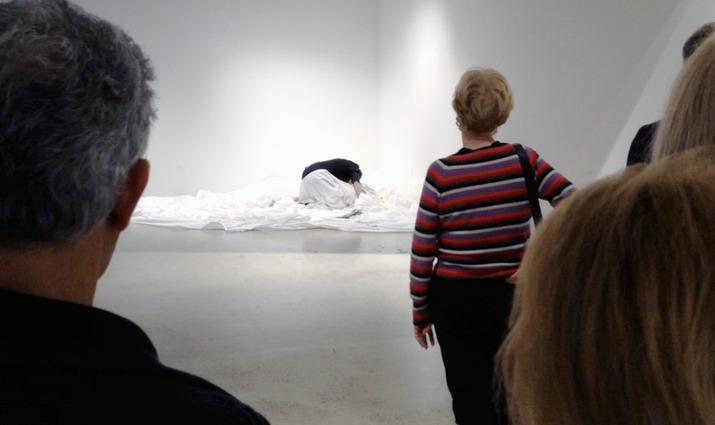 By superimposing or reversing images, altering rhythms of time and movement, adding/composing multiple narratives through her own musical re- workings of performers’ voices and sounds from the environment, she produces a “new” work of art. It is then displayed vertically. There’s a magician at work here. 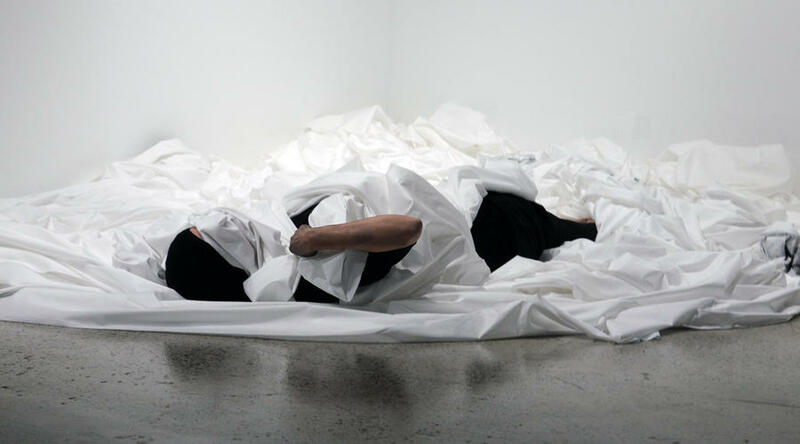 The installation/performance Aletheia II is a thirty-minute slow-motion exploration of an enshrouded “landscape.” In silence and clad in black, the artist gropes her way through a great swath of white sheeting, feeling for what is ‘unhidden, ‘unforgotten’ (from the Greek aletheia). As she moves, both she and the ‘landscape’ change form, mirroring the memories evoked, the loss absorbed. Here and there her hands encounter sticks of graphite; her gestures then mark her passing. That passing is visible, leaves traces: eventually the smudged shroud records her presence as it also envelops and protects – and keeps her close to – that which (that who?) is invisible, absent. 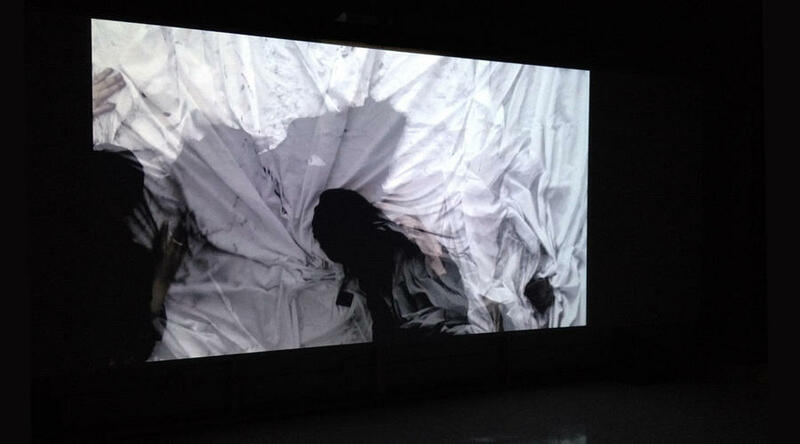 For all its poetic, dream-like flow and texture, the video Anamnesis II seems more explicit. Whatever the ‘reminiscence’ of the title, the women’s sorrow is exquisitely clear. It shows in their movement, their gestures, their black head scarves slowly removed to float among the waves of lamentation that swirl over the huge white shroud of their despair. This video is the outcome of a recent public project in Portugal, part of Weiss’ on-going exploration of public lament as an ancient, ritualistic, feminine form of expression outside language. Her work thus transcends barriers and boundaries: a video (Sustenazo) from a performance/installation in Warsaw lamenting the forced evacuation of a hospital during the Second World War found a receptive Chilean audience at the new Museum of Memory and Human Rights in Santiago earlier this year. Weiss now has plans to enshroud Tahrir Square in Cairo and have Egyptian women lament layers of more recent loss. Perhaps it will be completed by the time of her next show at Galerie Samuel Lallouz. Monika Weiss was born in Poland and received her musical and artistic training in Warsaw. She has been working out of New York since the mid-1990s. A faculty member at Sam Fox School of Design & Visual Arts, Washington University in St. Louis, the artist also publishes theoretical articles on her work. Weiss’ work continues to be the subject of noteworthy solo museum exhibitions internationally, including most recently her travelling exhibition Monika Weiss: Sustenazo, which was first commissioned in 2010 by the Centre for Contemporary Art Ujazdowski Castle in Warsaw, Poland, was then on view at Museum of Memory and Human Rights in Santiago, Chile (2012- 2013) and will re-open next year at The Patricia & Phillip Frost Museum, Florida International University. Her large-scale public projects include “Drawing Lethe” at the World Financial Center Winter Garden, curated by The Drawing Center, New York (2006). Weiss’ works have been also shown as part of acclaimed international exhibitions and publications such as Forms of Classification: Alternative Knowledge and Contemporary Art, Cisneros Fontanals Art Foundation (Miami), On the Absence of the Camps, Kunsthaus Dresden, POZA: On the Polishness of Polish Contemporary Art, Real Art Ways (Hartford), and Moment by Moment: Mediations of the Hand, North Dakota Museum of Art. In 2007 her work was included in a survey publication Drawing Now: Between the Lines of Contemporary Art (London: I. B. Tauris). In 2005 The New York Times reviewed Weiss’ survey exhibition at Lehman College Art Gallery, City University of New York. In collaboration with that gallery, Les Editions Samuel Lallouz published the catalogue, Monika Weiss – Five Rivers. Weiss’ work is in private and public collections worldwide. 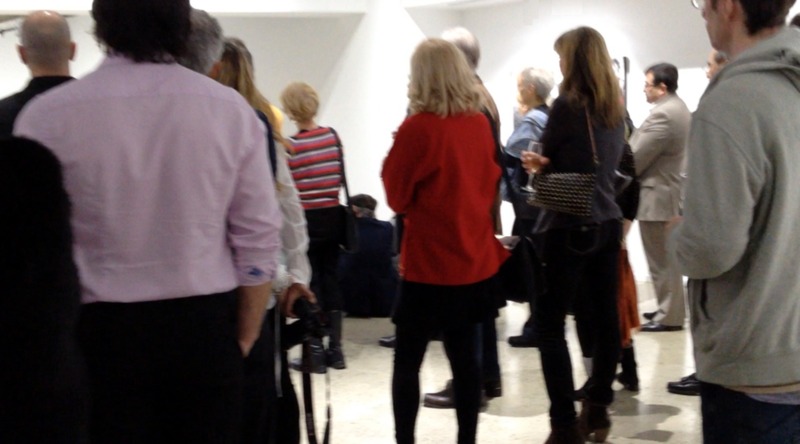 On display at Galerie Samuel Lallouz, 1455 Sherbrooke St. West, until December 31, 2013.